Former Florida Gators cross country runners Jeremy Criscione, Matt Hensley and Mike Hensley – all three of whom participated in the 2013 Boston Marathon in Boston, MA – avoided injury on Monday despite a pair of simultaneous explosions going off at the finish line of the race at approximately 2:50 p.m.
At least three people have already been pronounced dead, including a child. Criscione (28th – 2:21:45) and his immediate family, Matt Hensley (35th – 2:23:21), Mike Hensley (91st – 2:30:47) and another Hensley brother (who also raced) were all well clear of the area at the time of the tragedy. The runners completed the race just under two hours prior to the detonation of what law enforcement officials believe to be two improvised explosive devices. 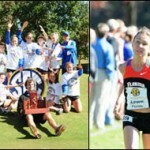 Florida spokeswoman Amanda Brooks confirmed to The Gainesville Sun that both runners are OK. Criscione and the Hensleys originally announced their statuses on their respective Facebook pages. Wow. . that’s really being on it, Adam. Great job, as usual. Thank you for that good news.